"If you want to survive this fantasy world, think outside the boxes." Holy mackerel, this looks amazing!! Gravitas has unveiled an official trailer for an indie comedy titled Dave Made a Maze, about an artist who builds a huge fort in his living room out of cardboard. The clever concept here is that as soon as you enter the maze, it turns into something much bigger. Dave builds the maze out of pure frustration, only to end up trapped by the "fantastical pitfalls, booby traps, and critters of his own creation." This stars Nick Thune, Meera Rohit Kumbhani, James Urbaniak, Stephanie Allynne, Kirsten Vangsness, plus Scott Krinsky. Ohh it looks like it's going to be so, so much fun, kind of like Michel Gondry meets the Duplass Brothers, or something like that. This really does seem like a certified instant cult classic. I'm ready to enter. An unaccomplished and frustrated artist builds a cardboard box fort in his living room and winds up trapped with a gang of oddball explorers in a fantasy world of his own creation, threatened by booby traps and a bloodthirsty Minotaur. 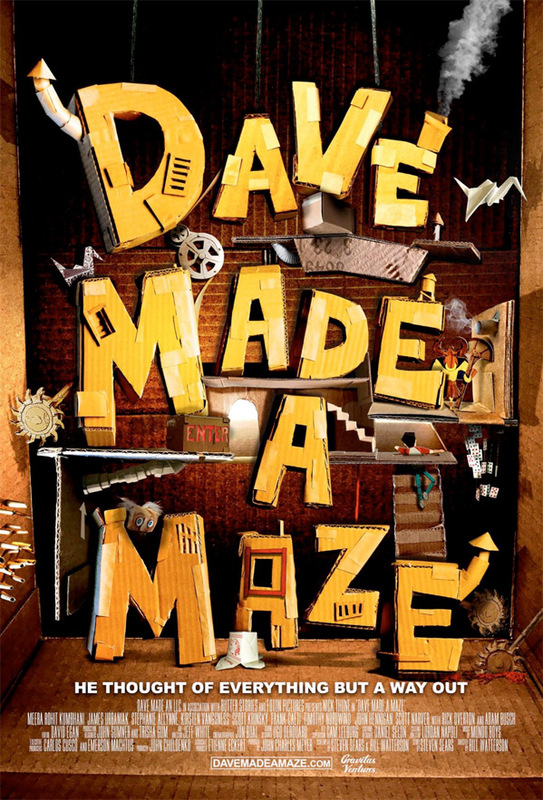 Dave Made a Maze is directed by American actor-filmmaker Bill Watterson, making his feature directorial debut after many bit roles, motion capture work, and production assistant work previously. The screenplay is written by Bill Watterson and Steven Sears; based on a story by Steven Sears. This first premiered at the Slamdance Film Festival earlier this year, and has played at many other festivals including the Boston Underground Film Festival. Gravitas Ventures will release Dave Made a Maze in select theaters + on VOD starting August 18th later this summer. Who else is ready to go inside?